Shrimp Scampi is one of my favourite meals! You really just can’t go wrong with shrimp in a butter and garlic sauce and it’s so quick and easy to make! Usually it’s served over pasta but it’s also great in pizza form! 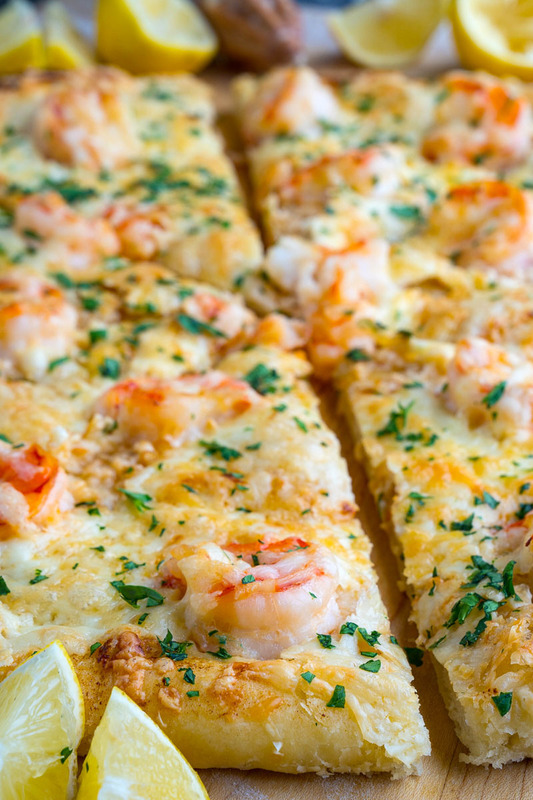 You basically cook some shrimp in butter along with garlic and spread it over pizza dough before covering in cheese and baking until the cheese is melted and everything is nice and golden brown and oh, so good! I like to serve shrimp scampi pizza topped with fresh chopped parsley and wedges of lemon to squeeze juice onto it just before serving! Melt the butter in a pan over medium heat, add the garlic, red pepper flakes and shrimp and cook until the shrimp is just cooked through, about a minute per side, before adding the lemon juice and removing from the heat. 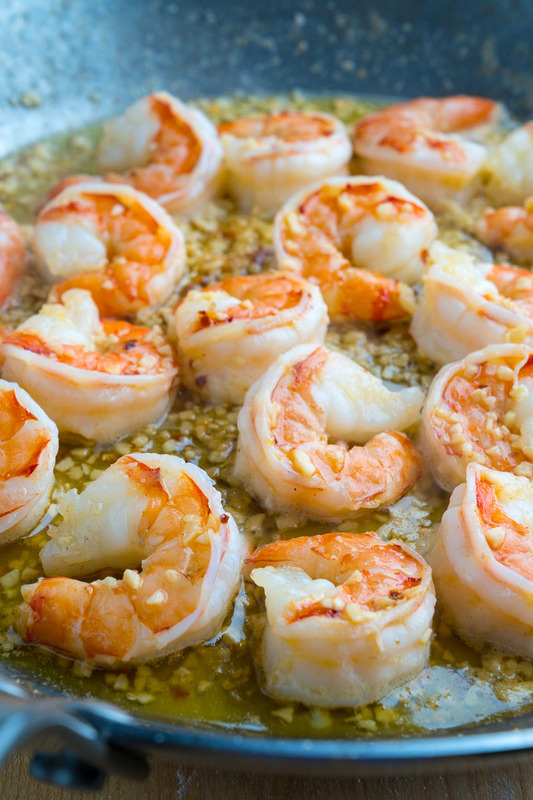 Spread the dough out on a baking sheet, spread the shrimp and the lemon butter-garlic sauce over and sprinkling on the cheese. Bake in a preheated 500F/260C oven until the cheese has melted and the crust is crispy and golden brown, about 10 minutes. Sprinkle with parsley and let cool. Option: Serve topped with fresh parsley and lemon wedges! Is 5 minutes at 550 degrees long enough to cook the crust? I like a crispy crust but I wouldn't want to overlook the crust. 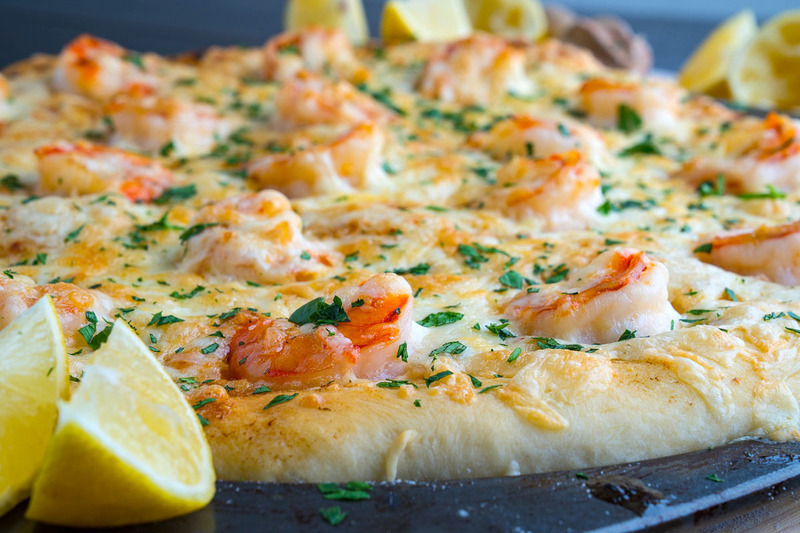 I love shrimp scampi pizza and would love to make it myself. I’m not a fan of shrimp, but the sauce for the pizza sounds great! I think I’m going to play around with that and see what I can come up with. As always, you have inspired me! I would never have thought of putting shrimp on pizza, but this looks and sounds scrummy. I want to eat it right now. Interesting recipe. 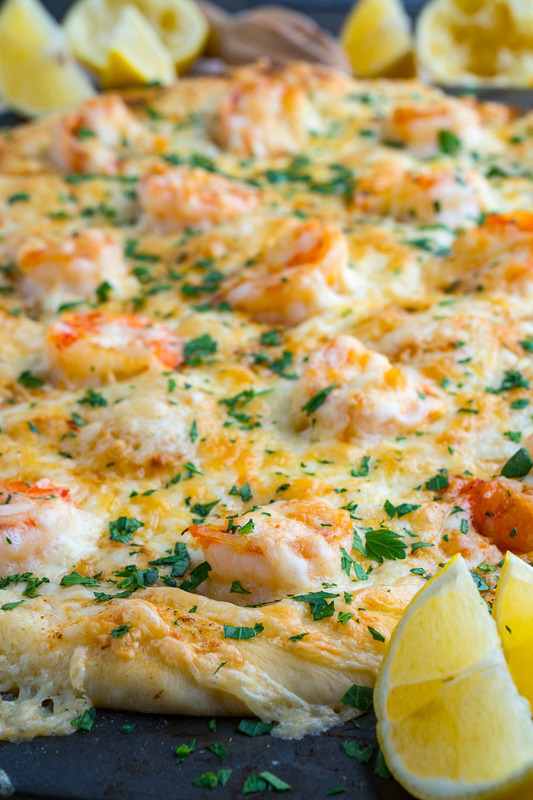 I can see how shrimp scampi would make a great pizza – it looks like you put it together well. I always love trying different kinds of pizzas. That looks divine – I love the simplicity. Sounds like the perfect pizza to me! Looks delicious. YUM! What a great idea for a pizza. Looks delicious Kevin. YUM I love my seafood too! The pizza looks delicious! Oh wow! This looks pretty good. I don’t know if I’ve ever had seafood on pizza before, but I’d sure be willing to try it! Wow what a far out but delicious idea. It’s like a garlic white pizza but with shrimp. Nice idea. I wouldn’t miss the pizza sauce either, the shrimp more than makes up for it. Kevin, the simplicity of this pizza is what makes it so good…shrimp, garlic, cheese…you bite into this and you know it’s shrimp pizza. That pizza looks perfect! 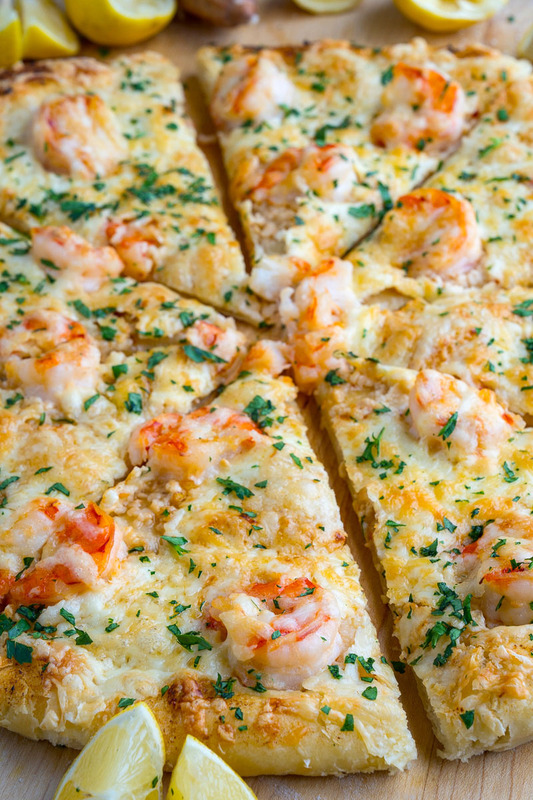 I’ve had shrimp scampi pizza before and it is delicious! I prefer lighter pies like this over the ones with heavy tomato sauces. Would love to eat it right now. Kevin, I’m completely sold on this one. My only change would be to replace the mozza with Gruyère. I love Gruyère with shrimps, wine and garlic. Good job. This is something I wanna try too! Use the shrimps as a pizza topping. Nice! I have some left over shrimp that I need to use up, this looks like a perfect way! Great looking pizza! The simplicity is what makes this pizza. Beautiful, Kevin! I love shrimp on pretty much anything. Way to go with topping your pizza with them…fabulous idea! I LOVE PIZZA. In any form. I think I would like this, because it would be LOADED with garlic. I have never had shrimp on pizza. It sounds like a nice change. I am so bookmarking this Kevin! Shrimp and pizza are 2 of my favorite foods! I love pizzas, but have to be honest not wild about piza with fish, scampi etc…. Your photos always make me drool, but somehow this does nothing for me. the shrimps looks delicious, making me wanting a sllice! Shrimp scampi on pizza. That’s awesome! I have to say, I’ve never thought of this one, but why not! Great idea. Kevin- This pizza looks fabulous! We are about to do some pizza grilling in the next few days, you are an inspiration. Looks great! Such an original idea! shrimp on pizza!! this recipe is a hit!! i love it! I’ve never thought of having shrimp on pizza, but I bet it was amazing!! I honestly can’t even remember the last time I ate pizza. When I did, I always loved the wonky toppings like bbq’d chicken and goat’s cheese or shrimp and asparagus. You’re killing me Kevin! Homemade pizza (and shrimp) has to be one of my favorites! The photo is calling to me! Ooh, we do this all the time! Garlic shrimp makes an amazing pizza topping. Delicious looking photo! The first thing I thought when I saw the picture (even before I read the recipe) was WOW! That looks great! My only suggestion would be to add a little bit of parmesan or asiago cheese to the blend. As an Italian, I should be kicking myself for suggesting seafood and cheese together at all, but you have to have cheese on pizza, and if you’re going to have one, why not go all out? I Looooovvvveeee white pizza….it’s sooo yummy. I’m licking my screen over this one! Fav is the good ole white spinach with portabellas sometimes. Not all the time. I was just thinking today that it’s been so long since I’ve made pizza. This could not have been more perfect timing!!! Very interesting. I never would have considered shrimp on pizza! Kevin, thats a brilliant idea, and one I want to try! what a fab idea~ pile on loads of cheese, with shrimp scampi. ooh that is good. What a great concept.I am going to take this recipe along with me to our vacation cabin next week.Perfect! Oh my, Kevin, that looks incredible! I’m going to have to give that idea a try next time I make pizza. That slice looks very tempting! Lynn: Yes, the crust will cook very quickly at 550F so keep an eye on it! This looks amazing! I 100% need this in my life! 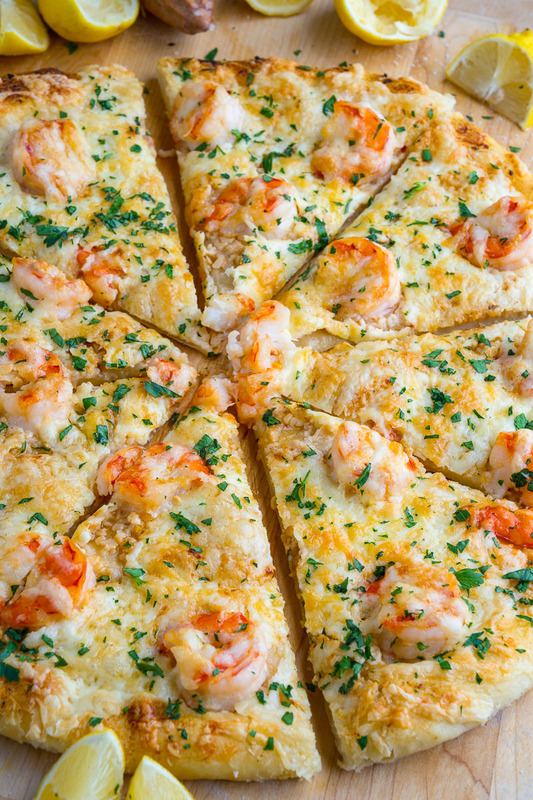 Oh my goodness, Kevin, this Shrimp Scampi pizza just looks so amazingly delicious! I cannot wait to get my hands on it and eat it. We love seafood and this recipe would be great for those days we just want to lounge in front of the television and watch movies. We are excited to try this! Do you think we can increase the amount of red pepper flakes for this? This is perfect for lounging with a movie! More red pepper flakes would be great! Enjoy! It might be worth your time to include a recipe for making pizza dough rather than purchasing the commercial options. There are any number of great recipes out there for both thin and thick pizza dough. I know you are marketing your site to the “busy person” who doesn’t want to spend much time cooking or preparing dough. But I would recommend that you consider a recipe for “homemade” dough that can be frozen and then defrosted in the refrigerator, prepped the next evening along with your pizza scampi recipe. As a fellow professional cook, I think it is a good time for us to begin encouraging more made-from-scratch recipes than the processed food options. So many Americans today simply have lost the knowledge-base of the joy of cooking and its hidden benefits cooking from scratch. It’s really not the pressure of time, but whether people want to eat food at home that is as good as or exceeds restaurant quality dining at half to two-thirds the cost. I like your scampi pizza recipe. I feel there is much potential to build on it. Please click on the link in the recipe for my pizza dough recipe. Oh man!! What happened to the original recipe??? I’ve had your recipe saved on Pinterest for quite a few years now (and we LOVE it), but when I came to make it last time, it had changed. It used to have white wine in it and possibly a few other slight changes. Any chance you still have the old recipe (this time I will write it down instead of just having it saved on the web)? I’ve tried this new version, but it doesn’t seem to be quite the same. Please help ;)!